Embracing the many colours of the jazz spectrum, Fat Yahoozah, led by the outstanding Ellen Kirkwood has lush horn sounds, African rhythms and an absolutely infectious ability to make you want to move. This fantastic band’s sound has been described as worldly dance beats with fat horn action! They will be joined by Lisa Parrott as a special guest artist on the baritone saxophone. Make sure you catch this free event. Ellen Kirkwood is one of the rising trumpeter/bandleaders/composers on the Sydney scene. 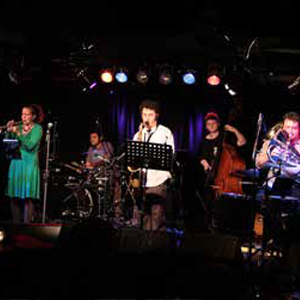 A graduate of the Sydney Conservatorium Jazz Studies course, In 2012 Ellen was awarded the Jann Rutherford Memorial Award and produced a work with to rave reviews with her band Captain Kirkwood of an extended composition ‘Theseus and the Minotaur’. Ellen has composed for, and is a member of The Sirens Big Band as well as Matt Ottignon’s dynamic Ethio Jazz fusion sextet Mr Ott where her compositions as well as her bright, open tone contribute to the band’s distinctive sound.